It’s your turn to take the wheel. The Audi Certified pre-owned Limited Warranty features Unlimited Mileage with coverage honored at over 300 Audi dealerships throughout the U.S.
As a compliment to an already exceptional Certified pre-owned program, we offer the confidence in knowing that the Audi Certified pre-owned Limited Warranty is easily transferable to a subsequent private owner. 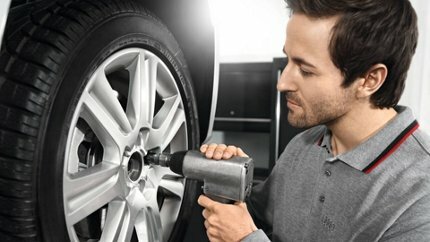 With a comprehensive 300+ point inspection performed by an Authorized Audi Dealer, you can be sure that your Audi Certified pre-owned vehicle is ready for the road ahead. Is there a warranty deductible? Looking for another reason to own? The inspection process, coverage and offers are solid reasons to own, but they're not the only ones. From the luxury performance to our time-tested design, we've put together a list of the top ten reasons choosing an Audi Certified pre-owned vehicle is the right decision. 1. A comprehensive 300+ point inspection. 2. Unlimited mileage warranty coverage. With an Audi Certified pre-owned vehicle, you not only get an impressive luxury vehicle, you also get the peace of mind that comes with Unlimited Miles under the Audi Certified pre-owned Limited Warranty. That means your Audi will have a solid backing. To put this into perspective, let's just say you have the desire to explore every last mile of the U.S. Interstate Highway System. While you have this kind of warranty behind you, there's no reason you couldn't do so in total confidence, especially knowing you can pull into any one of our dealerships across the country, should an unlikely mechanical issue arise. 3. The Audi Certified pre-owned program offers exceptional benefits. When you purchase an Audi Certified pre-owned vehicle, you can count on receiving benefits that live up to our legendary brand. From 24-Hour Roadside Assistance (which includes towing and trip interruption reimbursement) to easy transferability of the Certified pre-owned Limited Warranty to a subsequent private owner, we are there for you every step of the way. Plus, with a comprehensive Vehicle History Report required for every vehicle, you can focus on what you love to do most: driving your Audi. 4. Our vehicles are built to last. We know our vehicles will be on the road for a long time, so it makes sense that we design our parts to last at least as long as the vehicle is on the road, and in some cases longer. 5. Our vehicles are designed to stand the test of time. By looking to the past, we create designs that won't go out of style in the future. Just consider our iconic Audi Singleframe® grille. Its design dates back to 1935, but its iconic look is just as striking today as it was nearly 80 years ago. So what do design features like this mean for you? You'll never have to worry about your Certified pre-owned Audi looking outdated, and the time-less design will help retain its value. 6. The driver is top of mind. Our team of world-class automotive designers and engineers work tirelessly to make sure that every Audi is not only a stunning work of art, but also an exceptionally engaging vehicle to drive. This is apparent from the moment you sit in the driver's seat to the moment you power through the apex of a turn on a twisty mountain road. We've had the driver in mind since the beginning, and we're proud to say it. Get behind the wheel of the Audi that's been on your mind from the start. By purchasing an Audi Certified pre-owned vehicle, you'll have the chance to get into your ideal model at an exceptional value. This is an opportunity to make your automotive dreams come true — don't let it drive past. 7.5 million. That's the average number of miles our test team puts on Audi vehicles in a given year. Testing in every environment imaginable, from the scorching desert of the United Arab Emirates to the frozen tundra of Northern China. On top of that, every vehicle spends a considerable amount of time at our state-of-the-art factory testing facilities, so you can take comfort in the fact that every Audi has been thoroughly tested with a second owner in mind. 9. We've made owning an Audi Certified pre-owned vehicle even better. With special financing and extended vehicle service contracts, you can add ease and certainty to your Audi Certified pre-owned experience. 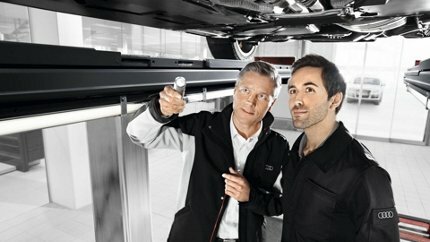 Audi Financial Services offers financing with competitive interest rates and terms, while our wide range of available coverage options gives you everything from extended service benefits with an Audi Pure Protection Certified pre-owned Service Contract to comprehensive protection with a Ding Shield Service Plan. It's just our way of making owning an Audi Certified pre-owned vehicle exceptional from start to finish. 10. We are committed to making you a lifelong Audi fan. Even after you drive off in your dream car, we pledge to do everything we can to keep the dream alive by offering you an ownership experience that rivals even those of the most exclusive clubs in the world. This applies to everything from the initial purchase to scheduled maintenance visits to the moment you're ready to purchase another Audi. Expect us to go out of our way to ensure that being an Audi owner is one of the most fulfilling experiences you'll ever have. If Audi New Vehicle Limited Warranty (NVLW) coverage remains at time of Certified pre-owned (CPO) purchase, CPO Limited Warranty Coverage commences upon expiration of NVLW and continues until 5 years from vehicle’s original in-service date with no mileage limitation. If NVLW coverage has expired at time of CPO purchase, CPO Limited Warranty coverage continues for 12 months with no mileage limitation. See owner’s literature or dealer for warranty exclusions, and limitations. *1.99% APR, no down payment required, available on MY13-17 A3, A4, A6, Q5, & Q7 Certified pre-owned vehicles financed by Audi Financial Services through participating dealers. Example: For 1.99% APR, monthly payment for every $1,000 you finance for 24 months is $42.54. Not all customers will qualify for credit approval or advertised APR. Offer valid January 3, 2019 - February 28, 2019. Offer not valid in Puerto Rico. See your local, participating Audi dealer for details or, for general product information, call 1-800- FOR-AUDI. ©2019 Audi of America, Inc. Optional Audi accessories shown. Please contact your dealer for pricing and availability.